Meridian has come a long way in terms of restaurants. I remember being in high school and having to drive to Boise just to get a decent espresso. Now I'm mere minutes away from gelato, barbecue, bagels, Thai, fresh bread, and some damn good sushi. A few years back a restaurateur heeded the winds of economic change, pulled out of downtown Boise and popped up again in an out-of-the-way strip mall in Meridian, bringing what many people consider to be the best Italian food in the Treasure Valley with him. I never went to Gino's back when it was in downtown Boise. Honestly, I almost never go out for Italian food because in my experience it never fails to disappoint. 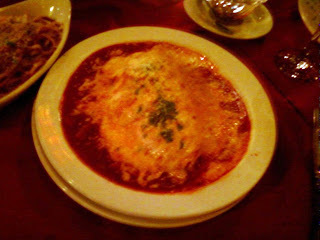 Don't get me wrong, I love Italian food, but I never had anything in a restaurant that wasn't better when made at home. Then, while doing research into restaurants in the Meridian area that might make for a fun meal (and subsequent write-up), I started coming across reviews of Gino's. More than once, I came across comments about the boar shank, and for the first time in quite a while I was interested in going out for Italian food. You see, ever since I saw First Blood, I've been curious as to what boar would taste like. Now I could find out in my own hometown, and likely get a glass of wine and a dessert as well! So, with Ms. Golden Rule in tow, I headed to the outskirts of Meridian. Way into the outskirts. Or so it felt. Almost missing our reservation due to road construction. But finally we arrived at Gino's new-ish home, a strip mall near the intersection of McMillan and 10 Mile Roads. I didn't really know what to expect, as all I had to go on was a few online reviews. Gino's has no website that I was able to find, and no online menu either, so far as I know. I didn't concern myself too much though, as I was pretty certain what I would order. When we entered, my hopes climbed a little more. The place was loud, but with good cheer and conversation, not obnoxious drunkenness. The decor, especially the light fixtures, was charming. There were a few people dressed nicely, but just as many in jeans and most were in business casual attire. Unfortunately the lights were pretty low, and I knew that getting any good pictures was going to be difficult. ﻿ Our wine arrived first. 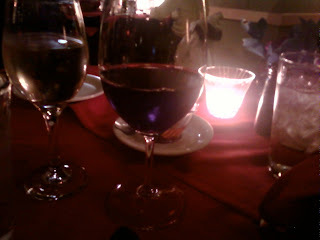 It was good but not excellent, but there was only one Pinot Grigio and one Chianti on the "by the glass" menu at all, so what can you do? It was still perfectly serviceable, and it's the kind of thing you learn to deal with when your table can't decide on a white or a red wine. Accompanying the wine was a hunk of hot, herbed bread cut into small sections. With this was a container of dipping oil infused with red pepper, packing a lot of spice and a fair amount of heat. Gino's is somewhat famous for this oil, and in fact they sell it at the bar for people who want to take some home. We both dug this quite a bit, and my carb-crazy companion has mentioned craving this again several times since our visit (much like I'm assuming I would have talked about the boar shank had I not ended up ordering it). Our appetizer arrived next, seven asparagus spears that had been grilled and dusted with grated cheese. This turned out to be the only real disappointment of the meal. 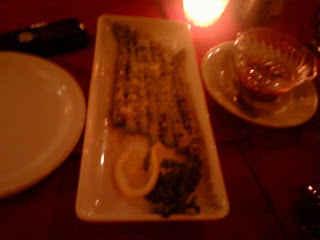 The asparagus had been charred nicely, but was lacking flavor and the cheese fell off, dusting the table before you could get it to your mouth. A drizzle of olive oil would likely have solved both of these problems. It was good, but not worth the price being asked. ﻿﻿﻿Not long after, our salads arrived. We had both chosen the house vinaigrette with blue cheese crumbles. We were presented the options of fresh ground pepper and fresh cheese. A word of warning: I don't know if it's house policy or if the woman with the cheese grater is just very enthusiastic, but she will unleash a blizzard of shredded cheese upon your plate faster than you would think possible, so be ready to say "enough" at any moment. Admittedly though, if you like cheese as much as our table did, this is not a bad thing. As to the salad itself, I was very happy. Dark greens, ripe tomatoes, tangy dressing and lovely rich blue cheese. This is the thing I've been craving over and over again. You can buy a pretty decent bottled blue cheese vinaigrette, but it's just not the same. What was set before me was everything I had fantasized this dish would be since I first read about it. A big portion of smoked boar meat, still on the bone and surrounded by delicately little gnocchi in the insanely flavorful sauce that the shank had been simmering in for hours. I accepted a very little bit of fresh cheese on top, but cut the woman with the grater off almost as soon as she had started. I didn't want anything to interfere with the flavor of this dish. The only thing I would have changed would be the gnocchi. I'd never had gnocchi before so I don't know if these were good or bad ones, but with a meat and sauce this rich I would rather have had some spaghetti or angel hair pasta than dumplings. Still, they were very good and absorbed the flavors in the sauce nicely (which is precisely why my companion didn't like them, she said they tasted like boar). But the meat and the sauce...my god. I'm not a big sauce person most of the time, even when I make spaghetti at home I use the minimum amount of sauce required to coat the noodles. With a sauce this good though, wasting it would be criminal. With every gnocchi and bite of meat, which fell apart easily with the gentlest prodding by my knife and fork, I scooped up as much sauce as possible. I found myself wishing for more of that lovely bread from earlier to make it easier to mop up. But in the end, it was all about the meat. The flavor was intensely smoky, rich yet not gamy, the texture only slightly more resistant than a pot roast that has spent the entire day in a slow cooker. At some point, you run out of adjectives, you know? I really do need to buy a thesaurus for moments like this. But for now, let's leave it at this: absolutely effing delicious. I surprised myself by finishing the entire thing and yet was still sad there would be none to take home. But I wasn't about to get off that easily. I was sharing a table with a woman who believes dessert is a right rather than a privilege, after all. 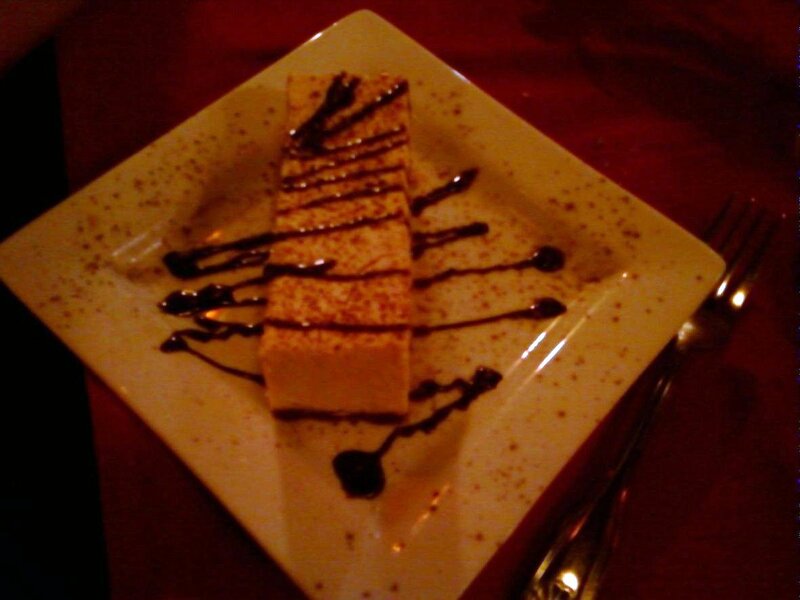 Though I was most interested in the mousse, I deferred to the lady and we opted to split an order of tiramisu. The wine was long gone at this point so we ordered coffees as well.